In view of the growing complexity of global securities markets, Nuland & Arshad, Inc. is focused on providing discretionary management of client investments. We are responsible for investment policy and specific investment decisions within the guidelines laid down and agreed by our clients. We provide clients with close supervision of their investments and full reporting to each client is made quarterly. Flexible support systems enable us to calculate both the value and capital gains tax position of investments whenever required. In order to be more responsive to our clients' varying needs we combine knowledge and experience with those of skilled lawyers and accountants who specialize in tax and estate planning. 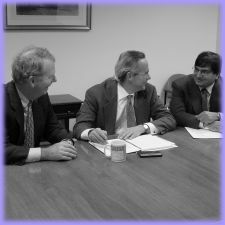 In a number of cases, Nuland & Arshad, Inc. has accepted large clients who prefer to make investment decisions themselves. In these cases the same methods of supervision apply as for discretionary accounts except that investment policy is discussed with each client at a series of regularly scheduled meetings, usually monthly.